The ORIGINAL Scavenger Hunt Baby Shower Game! This Scavenger Hunt Baby Shower Game will give your party a cute & clever touch, and everyone will find this game a refreshing change from the "usual" baby shower games. "I am throwing a baby shower for my sister. I loved the games you have and I was wondering if you had a Scavenger Hunt with clues that are a rhyme or riddle so people would have to think before they could find the item." After reading Kayleene's email, I thought about how fun a baby shower game specific scavenger hunt would be. 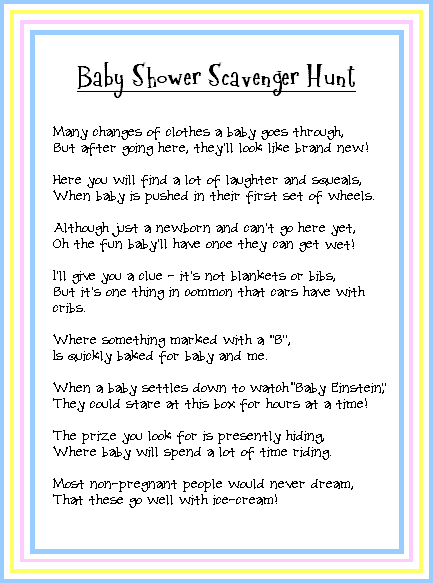 I searched online and could not find any scavenger hunt games that have specific baby-related clues to follow, so I created the following original Scavenger Hunt baby shower game. Great suggestion Kayleene! This baby shower game scavenger hunt assumes that you would have the following rooms at your party location: A kitchen (with a refrigerator & an oven), a laundry room (or a place for a clothes hamper), a bathroom (with a bathtub), and a TV room (with a TV). You could hide little prizes at each location for each guest to find and take one (little mints, chocolates or candles). Or you could hide tickets/cards at each location and the person who collects all of the cards first wins a prize. Print off these Scavenger Hunt baby shower game cards and give one to each guest. Then tell everyone that they must find the prizes or tickets using each clue on their card. You could pair 2 or 3 people together to make it more fun & interactive. But after going here, they'll look like brand new! The laundry room! Hide the prize in the laundry room or in a laundry basket/clothes hamper. When baby is pushed in their first set of wheels. A baby stroller! Hide the prize in a baby stroller (borrow someone's baby stroller and put it in the entry way or front room and put the prize inside the stroller). Oh the fun baby'll have once they can get wet! The Bathtub! Hide the prize in the bathtub (If you don't have a bathtub at your party location, borrow the kind of baby bathtub that fits onto a normal sink and put it in the sink in the bathroom & hide the prize in the baby bathtub). But it's one thing in common that cars have with cribs. They both have bumpers! Go out to the driveway/parking lot and tape or tie a prize onto the bumper of your car. Is quickly baked for baby and me. The oven! Hide the prize inside the oven in the kitchen (just be sure that no one turns the oven on during the baby shower game!). They could stare at this box for hours at a time! The T.V.! Tape or position the prize on or near the television set in the entertainment room. Where baby will spend a lot of time riding. The car seat! Borrow somebody's baby car seat and place it in a visible location in the entry way or front room or hallway and hide the prize inside the carseat. That these go well with ice-cream! Pickles! And where are pickles kept? In the refrigerator (or pantry, if unopened). Hide the prize inside the refrigerator by the pickle jar. There are 4 different versions of this Scavenger Hunt baby shower game so that there are 4 different clues to start with. That way, it won't be everyone heading for the same clues at the same time. Good Luck on the Baby Shower!